First you smell it, then you see it, now you can do something about it! Skout’s Honor Professional Strength Stain & Odor remover with BioKore goes to work immediately to lift and dissolve stains at the source. Our proprietary Odor Eliminating technology destroys stinky odor molecules on contact to leave your abode looking and smelling like nothing ever happened. 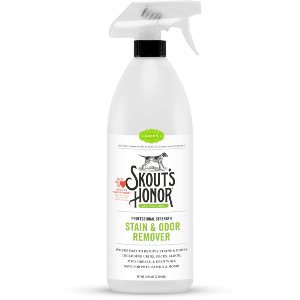 All Skout’s Honor products are non-toxic, biodegradable, eco friendly and free of harsh chemicals, chlorine and formaldehyde, so you can safely and responsibly remove even old dried up stains in minutes.